Azemour les Orangers is the newest release by Parfum d’Empire. I’ve been eagerly waiting to try it and dear Tara came through and sent me her sample. 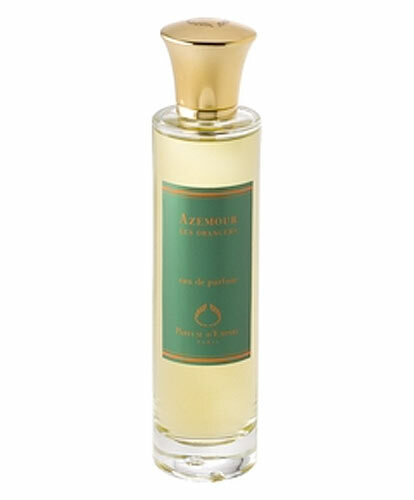 Purportedly a real chypre, Azemour is called after a region in Morocco, where the perfumer spent part of his childhood. Azemour les Orangers was created by Marc-Antoine Corticchiato in 2011 and includes notes of orange, grapefruit, mandarin, citron, coriander, cumin, black pepper, pink pepper, cassis, galbanum, neroli, geranium, orange blossom, rose, hay, moss, henna and iodine. 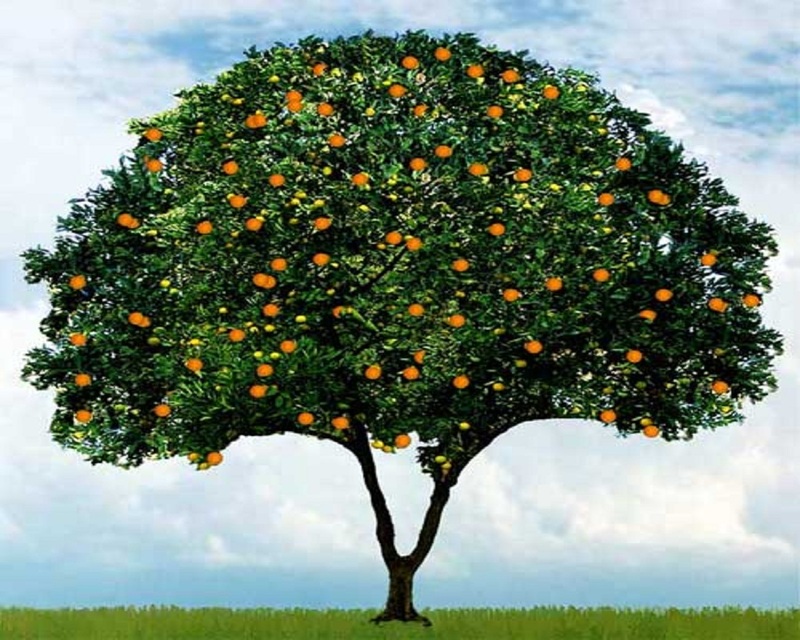 Azemour les Orangers includes all aspects of an orange tree, the fresh fruit, pulp and peel, the leaves, the blossoms, the bark, the earth the tree stands in, it is all there. Starting fresh and like biting into a ripe orange, Azemour becomes very green, very quickly. Galbanum is there and an interesting spicy facet with not too much cumin. I am not a cumin fan, but I don’t find it very prominent here so it doesn’t bother me. (It bothered Tara, I believe.) The green darkens and deepens and the oakmoss becomes prominent, evoking damp soil and dark shadows. Azemour les Orangers lasts for at least eight hours on me and has average sillage. Now, in the deepest cold of winter it brings a ray of sunlight into my days, but it is by no means an easy to wear, happy-go-lucky perfume (there are other oranges for that for example Atelier Cologne Orange Sanguine or Malle Bigarade Concentrée), but a very grown-up, somber and dark chypre that means business. I am glad a perfume like Azemour was created, and even if I am not in the mood for it every day, it is something I thoroughly enjoy wearing from time to time. It lends the wearer an air of sophistication and maturity, an earnestness, a sense of purpose. For me Azemour is a perfume that helps me concentrate, and reminds me to keep my back straight and my ducks in a row. It is a bit like a strict teacher, who doesn’t make it easy for you but whose lectures you still remember years later and value for life. The entire tree I can smell in Azemour les Orangers not only gives me the delicious fruit that conjures a smile on my face, but it is a strong tree, one I can lean on and that provides shade and shelter, should I need it. It may seem severe and stern at times, hard and unyielding, but in the end you realize that this inability to bend and give way is for your own good. Sometimes you need something that endures without bowing, that holds without letting go. This entry was posted in Chypre, Citrus, Floral, Fragrance Reviews, Fruity, Green, Oakmoss, Parfum d'Empire and tagged Azemour les Orangers, Chypre, Fragrance, Marc-Antoine Corticchiato, Oakmoss, Orange, Parfum d'Empire, Perfume, Review. Bookmark the permalink. Was it really launched in 2010? It is surely something every Perfumista needs to try, a true oakmoss chypre is a rare thing and even if one does not like it, it is worth smelling for educative purposes if nothing else. Have a lovely day, too, Alexandra! A sombre and dark chypre?! Count me in! I’m the same. I certainly must try this one, especially because I’ve read so many good reviews abut it. The perfume community seems to be mostly delighted with Azemour, it seems. ALO is not really a chypre, and it couldn’t be. The PR material is delusional, I’m sorry. It has oakmoss listed among its ingredients, but it is a (woody) citrus scent. Of course, I understand that some people might pick the mossy facets more than others, and if you like woody citrus compositions this is definetly worth a shot. PDN’s New York is much more bitter-mitsouko-y-mossy than ALO, If you’re looking for a mossy citrus. The quantities of oakmoss in Azemour are definitely not on the same level as the chypres of old, they can’t be due to regulations, that is true. Nevertheless is this very close to what my understanding of chypre is, than most of the so-called modern ones. What else is a chypre than an accord of citrus and woody/mossy notes? I think we are not the first, but probably the least important people to not agree on the classification of a perfume. Henna! … is really that note noticed? There are many different kinds of henna (they can evoke from freshly cut grass to dried grass, hay…etc), but they have in common a distinctive earthy, wet, deep smell of mud that it’s very ‘botanical’. That is very fitting after all, my impression of earthiness and roots is probably evoked by henna as well as the oakmoss. Every time I did my henna at home was an extremely penetrating aromatic experience. The smell lasted for more than a week on my hair, it never left me easily. I still remember that smell. My father used to say: “Oh, no that spinach again!” It really doesn’t have a lot to do with spinach, maybe if there were some earth from the garden included ;-). Thanks god I don’t have to do that anymore. I like citrus in parfume very much, I am a cologne person. But am I chypre with citrus person ? Yes, the cumin in this was a deal-breaker for me but I do have a particular aversity to the pairing of orange with cumin . I admire the composition though and a mossy chypre is very a good thing. Love those Parfum d’Empire bottles too btw. Love your description, that it contains the whole tree in the earth. And the somberness sounds intriguing. I got a decant of this as soon as it came out and at first try it smelled too masculine but, still, I couldn’t remove my nose from my arm. You know how that goes: repeated trials and you’re hooked! I love Grand Neroli, an uplifting comforting orange. Azemour is not. You describe it very well. It is somber and it’s wistful, which makes sense seeing as how it’s based on the perfumer’s memories of a place. Oh, I know about the several tries and you are hooked thingy. 🙂 I’m glad you like it too, Suzy Q. Great review. I find the name to be a little misleading as Azemour les Orangers lacks the orange trees part. Hardly a study on orange/zesty notes, Azemour is a well excecuted and unisex chypre. I was expecting something more upbeat though. I totally agree, one expects a different perfume, something more along the lines of Orange Sanguine for example. But although what you get is unexpected, I am impressed with it and like it a lot. “It is a bit like a strict teacher, who doesn’t make it easy for you but whose lectures you still remember years later and value for life”! I love it, considering that I AM a teacher and Azemour is one of my signature fragrances! Thanks for this review, I really appreciate it. How lovely that this perfume suits you so well. I almost envy your pupils. That is the best about a really good perfume, it keeps offering new facets with every wearing! Thank you! The sample set from Parfum d’Empire is well worth investing in. But I have a spare Azemour sample and Equistrius and Ambre Russe I can decant for you. I’ll pack them in, before I finally take your package to the post office tomorrow! Oh, sombre, stern and dark chypre, this must be the perfume for me (says the girl who adores Mitsouko and Bandit)! Azemour might be great for you as a Mitsouko lover! Wow, you put a lot of faith in us bloggers! I’m so glad you didn’t regret it. BV is surely the best mainstream release for me in quite some time. Glad you didn’t live to regret your blind buy of Bottega Veneta, Eva S – what a weight of responsibility reviewers collectively bear without even knowing it…! I am another person for whom this post about Charles Aznavour, as I keep wanting to call it, is most timely. Have heard this scent mentioned as a bright citrus (a male friend has asked me to find a perfume approximating to the plant lemonbalm – which is very specific, I know…), and having read your review I don’t think this is it. It sounds like the orange equivalent of PD Antonia?? You can’t help me at all on the lemonbalm front, by any chance – off-topic, I know. Charles Aznavour is no lemonbalm, that is for sure. It is no bright citrus, the weight lies more in the woody and earthy parts of the tree, making up the major part of wear time, when the fruit is long gone already. So beautifully written! Your style is truly inspiring. Thank you! You make it sound absolutely unique! Corticchiato is one of the most talented perfumers right now and I really look forward to trying this. I would love to hear your toughts on this, Christos! I think your review is the most valuable of all those I’ve read of this perfume. You hit it spot on with the melancholy, serious, kind of McGonagall type vibe. Every year I make a natural chypre’ (based on old formulae) for Russian New Year’s Eve. That’s a joyful time, but also when we traditionally contemplate, in that dark Russian manner, the past year, the meaning of our lives, the state of the universe from our puny perspectives, and so on. Chypres of the old school are perfect for those times, and I love wearing them for the contemplation and nostalgia they induce in me. It seems the perfumer was having the same sort of nostalgic (in the Russian, not American sense) reverie when he created this scent. I will find a way to try it! Thank you very much, Marla, I really appreciate such a big compliment coming from you! The Russian way of wistful contemplation is a very good metaphor for this perfume, that is exactly what it feels like to me. Seriously tho’: I love your image of the strong tree. That’s what I hope to be for my children. I am so hoping my sample of AleE is in my post box THIS AFTERNOON. If not I will die. Oh, I hope it is there as well! Let us know please, if you don’t get back to us, we’ll fear the worst!!! Actually, I had you in mind when I thought about who would like this perfume, it is quite your thing, I believe. Oh no. My fingers are crossed for Monday! Parfums d’Empires has released some great scents (Fougere Bengale, Ambre Russe, Cuir Ottoman, Osmanthus Interdite). I recently bought their complete sample pack: 13 samples for 16 Euros… complete with booklet and handwritten note. Can’t beat this kind of costumer service. I was lucky enough to get this sample from Ruth – I felt that the opening was too bitter for me but I did like the bit of cumin/coriander because it became a dirty chypre for me. This is a great introduction to the line for me, now I want to discover more. Ambre Russe is next on my list! Alexis, it is a great line. They offer a sample set on their website, with generous spray samples. It is a great deal imo.